Non-fiction – paperback; Michael O’Mara; 192 pages; 2005. 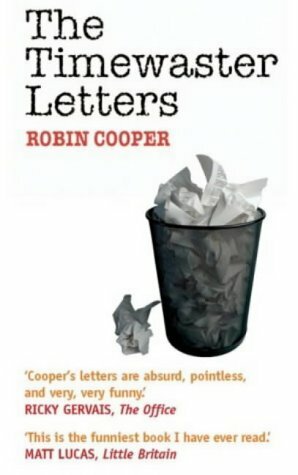 Robin Cooper’s The Timewaster Letters is quite possibly the funniest book I have ever read. Basically it’s a series of letters, written by the fictional Robin Cooper, asking obscure questions or making obscure requests which have been sent to obscure, often intriguingly named, organisations throughout Britain. The ensuing real life correspondence, which often gets more absurd with each passing letter, is published in its full, shameless and unabashed glory. In his letters Cooper asks all kinds of whimsical, nonsensical and outlandish questions, which are hilarious in themselves. But the big laughs come when you read the often tactful, polite and inane ways in which they are answered. This isn’t my normal kind of read. The book doesn’t tell a story as such. It’s just a fascinating and very funny collection of letters that should only be read in the privacy of your own home: unless, of course, you don’t mind hooting with laughter in public places.